Blog Tour- It’s the little things! In a house full of girls it’s easy to say that dolls, dresses and parties rule my world! 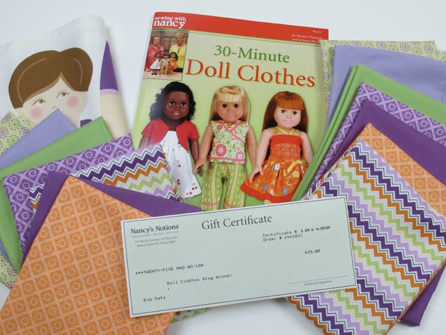 So, when asked to preview the new 30 minute Doll Clothes book and be part of Nancy Zieman’s tour, I was all in! To keep the project personal, I decided to create an outfit from one of my daughter’s favorite dresses. She is growing so fast these days! But on a bright note, I am all about reclaiming and this was a perfect way to keep that special memories alive! Plus- bonus, my hem was already finished!! This saved me so much time. In fact, it almost felt like cheating! The book includes patterns and step by step instructions that are super easy to follow. To keep my book in tacked, I photo copied the pattern for easy cutting. Pressing & clipping curves are key. Reduce your stitch length. This will increase your stitches per inch and help when stitching around small curves. Since my little girl loves to take tea, I thought it only fitting to create a party dress! Here are a few other sweet treats you will find at our parties. At the end of the tour, lucky readers will be selected at random to win fun prizes. To be eligible, post a comment at the bottom of Nancy’s July 10 blog tour posting. Share with us your memories of making doll clothes or what types of doll clothes patterns you’d like to see in the future. Winners will be posted on Tuesday, July 24th. Nancy Zieman’s Doll Clothes Blog Tour Prizes. Looks like a great book! My daughter obsesses about her American Girl dolls and about breaks the bank with all the outfits she wants. Can’t wait to see the rest of the tour. Thanks for participating and letting us know about Nancy’s book. I love your idea for using one of your daughter’s dresses that she outgrew! Such a neat way to remember a favorite outfit! Sounds like a neat book too! Love the doll clothes, so cute. I can see my daughter using these. Can’t wait to check out the book. hope to start sewing soon…can’t wait to make the doll clothes. How sweet! I love the goodies you created. 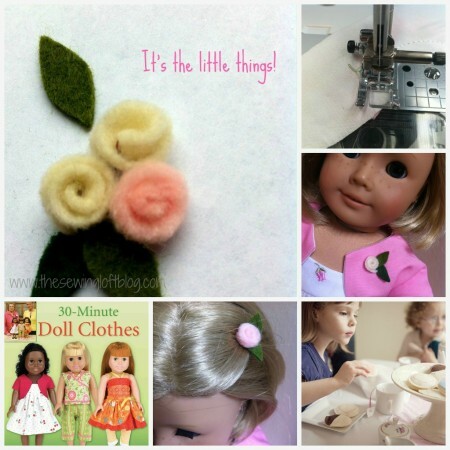 I’ve been making doll clothes for years (many, many yearS) and Ilove to see new tips and tricks to save time. thanks for sharing. 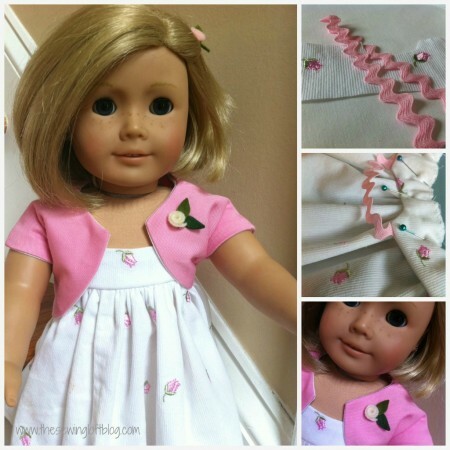 Great idea to use your daughter’s outgrown clothes to make doll clothes! Thanks for the sewing tips, too. I read your comments but I didn’t see any doll clothes that you made. Did I miss them somehow? I made the pretty little white dress with pink flowers from my daughter’s outgrown dress. I also made a cute pink jacket. I just loved Nancy’s gathering technique. this is a great idea for those dresses that have great memories attached. Good idea, upcycling kids clothing, thanks. What a great idea to repurpose an outgrown favorite childs dress! I love the idea of making clothes for my dolls and animal creations and something that I can make in 30 minutes or less, is a big plus. I just ordered my book & DVD! Can hardly wait! Thanks for your tips. I never thought about reducting stitches! Makes sense! I like to make fancy party dress for AG dolls. HELLO! WHAT A NEAT POST+I THINK THE BOOK WILL BE GREAT! THANKS SO FOR SHARING! I wish I could see a photo of the actual dress, not just the cropped shot in the collage. Did I miss where i can see the full dress? I was having trouble standing my girl up on her own. But have added a photo of the finished outfit. I hope you enjoy it! It looks like a great book. Thanks for making the process a little easier a little easier with your tip about reducing the stitch size. I’ve made doll clothes over the years and never thought of that. I can’t seem to find a picture of your completed outfit. Would love to make some doll clothes with my 30’s fabrics. Where is the picture of what you made? All I see is a tiny partial picture in the collage. I had trouble standing my girl up but I have added additional photos. One is of the finished outfit. Love the outfit. The book looks great. I haven’t seen as many patterns that turn out so cute. Thank you for the idea of a little pin on the jacket. When our girls were little, Barbie doll clothes were the item of the day. Now there are grandchildren. The dress you made with the cute pin and hair piece are darling. I have grand daughters that would love it. I have the book , and I love it. Such a sweet little pin!